Children in the UK with type 1 diabetes are being recruited to test an artificial pancreas. The device could allow users to more tightly control their blood glucose levels without the need for repeated jabs to test blood and give insulin. It could give people with diabetes more flexible lifestyles and defend them better from complications. The computerised glucose sensor will be tested in a trial run by Cambridge University scientists from January. The artificial pancreas is made up of the sensor, a computer programme that calculates how much insulin is needed to keep blood sugar in check, and an insulin pump. The purpose of the trial, run by Dr Roman Hovorka and backed by the Juvenile Diabetes Research Foundation, is to perfect the computer algorithm so the glucose sensor can "talk" to the insulin pump effectively and mimic the work of a normal pancreas. Dr Hovorka hopes that after a series of clinical trials over the next two years the device could be used by children in their own homes. He said it could be four to seven years before it is available commercially. Many diabetics already use an insulin pump - a small device worn outside the body that pumps insulin into the body through a thin tube under the skin - to remove the need for a daily series of injections. But they still have to test their blood many times each day to measure their blood glucose. 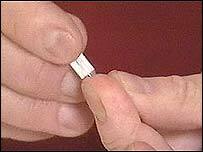 These finger prick tests only give a snap shot of blood glucose. In comparison, continuous glucose sensors, the size of a credit card and worn on the skin, read glucose levels on a minute-by-minute basis using a small sensor that is inserted under the skin. Achieving good blood glucose control dramatically lowers the risk of serious complications such as blindness, stroke and premature death. Studies have found that even patients who aggressively manage their disease - measuring their blood glucose an average of nine times a day - spent less than 30% of the day in normal range. The rest of the time, their blood sugar levels were either too high or too low. Trials show patients using continuous glucose sensors spend 26% more time in normal glucose range, and have statistically significant improvements in a measure of longer-term blood glucose control, called HbA1c. Cambridge is one of nine international research centres testing the artificial pancreas. JDRF chief executive Karen Addington said: "Achieving good blood glucose control dramatically lowers the risk of serious complications, by as much as 75% for some problems. "Once perfected and made available, the artificial pancreas will bring a huge sense of relief to children with type 1 diabetes for whom multiple daily insulin injections and finger prick blood tests are such a tremendous physical and emotional burden." Cathy Moulton of Diabetes UK said the concept was a very exciting one. "Achieving good blood glucose levels is essential to the management of diabetes and preventing diabetes complications such as blindness, amputation, kidney problems and heart disease." In Type 1 diabetes the body stops making insulin and the blood glucose level goes very high. This type of diabetes usually appears before the age of 40 and accounts for between 5 and 15% of all people with diabetes. Treatment to control the blood glucose level is with insulin injections and a healthy diet.